Base and superstructure are two linked theoretical concepts developed by Karl Marx, one of the founders of sociology. Simply put, base refers to the forces and relations of production—to all the people, relationships between them, the roles that they play, and the materials and resources involved in producing the things needed by society. Superstructure, quite simply and expansively, refers to all other aspects of society. 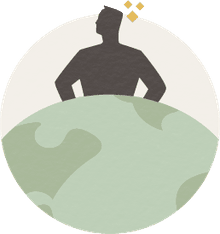 It includes culture, ideology (world views, ideas, values, and beliefs), norms and expectations, identities that people inhabit, social institutions (education, religion, media, family, among others), the political structure, and the state (the political apparatus that governs society). Marx argued that the superstructure grows out of the base, and reflects the interests of the ruling class that controls it. As such, the superstructure justifies how the base operates, and in doing so, justifies the power of the ruling class. From a sociological standpoint, it’s important to recognize that neither the base nor the superstructure is naturally occurring, nor are they static. They are both social creations (created by people in a society), and both are the accumulation of social processes and interactions between people that are constantly playing out, shifting, and evolving. Marx theorized that the superstructure effectively grows out of the base and that it reflects the interests of the ruling class that controls the base (called the “bourgeoisie” in Marx’s time). In The German Ideology, written with Friedrich Engels, Marx offered a critique of Hegel’s theory of how society operates, which was based on principles of Idealism. Hegel asserted that ideology determines social life--that the reality of the world around us is determined by our mind, by our thoughts. Considering historical shifts in relations of production, most importantly, the shift from feudalist to capitalist production, Marx was not content with Hegel’s theory. He believed that the shift to a capitalist mode of production had sweeping implications for the social structure, culture, institutions, and ideology of society—that it reconfigured the superstructure in drastic ways. He posed instead a “materialist” way of understanding history (“historical materialism”), which is the idea that the material conditions of our existence, what we produce in order to live and how we go about doing so, determines all else in society. Building on this idea, Marx posed a new way of thinking about the relationship between thought and lived reality with his theory of the relationship between base and superstructure. Importantly, Marx argued that this is not a neutral relationship. There is a lot at stake in the way the superstructure emerges out of the base, because as the place where norms, values, beliefs, and ideology reside, the superstructure serves to legitimate the base. The superstructure creates the conditions in which the relations of production seem right, just, or even natural, though, in reality, they may be deeply unjust, and designed to benefit only the minority ruling class, rather than the majority working class. Marx argued that religious ideology that urged people to obey authority and work hard for salvation in the afterlife was a way in which superstructure justifies the base because it generates an acceptance of one’s conditions as they are. Following Marx, Antonio Gramsci elaborated on the role of education in training people to obediently serve in their designated roles in the division of labor, depending upon into which class they were born. Marx and Gramsci also wrote about the role of the state—the political apparatus—in protecting the interests of the ruling class. In recent history, state bailouts of collapsing private banks is an example of this. In his early writing, Marx was very committed to the principles of historical materialism, and the related one-way causal relationship between base and superstructure. 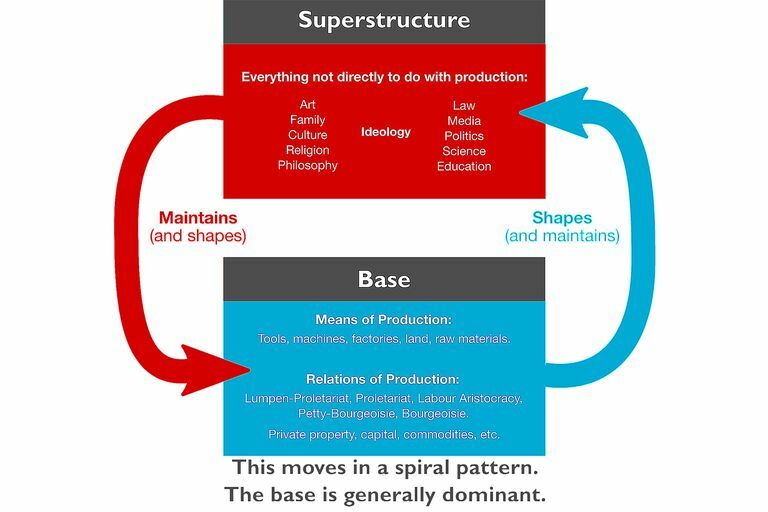 However, as his theory evolved and grew more complex over time, Marx reframed the relationship between base and superstructure as dialectical, meaning that each influences what happens in the other. Thus, if something changes in the base, it causes changes in the superstructure, and vice versa. Marx believed in the possibility of a revolution among the working class because he thought that once workers realized the extent to which they were exploited and harmed for the benefit of the ruling class, then they would decide to change things, and a significant change in the base, in terms of how goods are produced, by whom, and on what terms, would follow.